My friend Davis came over to make pasta and it was a blast (besides the fact that his batches kept turning out better than mine). 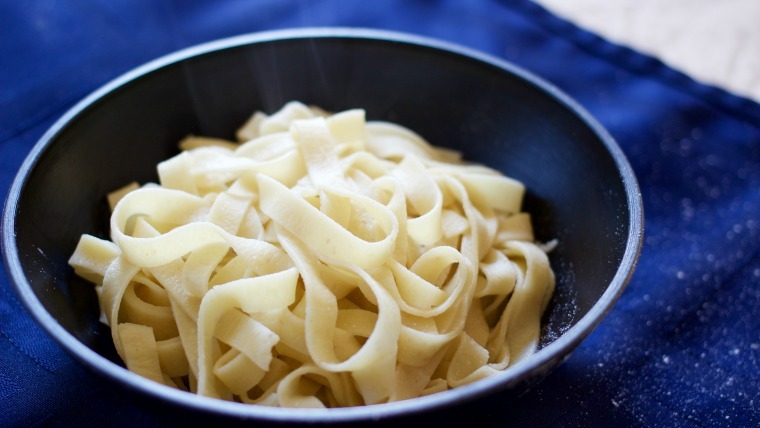 He’s a whiz in the kitchen and at the grill but hadn’t made fresh pasta at home yet. He even brought over some Scotch for us to try, and we made an afternoon of it! J and I are trying to learn to “appreciate” Scotch so that we can visit distilleries on our trip and not feel like we have no idea what’s going on. I’ve been to one, but I didn’t like Scotch enough at the time to enjoy it. Alas, we are attempting to enjoy them now. It was super awesome of Davis to let us try what he had and see which ones we like (so far, I’m partial to the Balvenie double barrel). With a glass of Scotch in hand, we set out to make four batches of pasta for community group the following evening. I’m pretty sure that this experience with my little hand-crank machine has convinced him to get a KitchenAid attachment (affiliate link), though! I find it super therapeutic, but it is definitely time consuming. I have mentioned the Tyler Florence recipe in the ravioli post, and truthfully, I’ve found it to be a great go-to. The only variation in my recipe today is the substitution of fancy salt and local eggs (mind you, they’re all sorts of shapes and sizes!). It requires a bit more estimation, I’d imagine, than batches made with commercial eggs. My advice is to roll it out until 2 or 3. Three for a thick egg noodle and 2 for a standard noodle. I’ve come to find that my lowest setting is just simply too thin for what I’m trying to accomplish most of the time. My 2-widths were all dry within 24 hours and ready to place in airtight containers or to be cooked and eaten! I hung them all on a rack similar to this (affiliate link). What do you put on top of your pasta? Place flour in center of counter or the bowl of a standing mixer. Make a well in the middle of the flour mound and crack eggs into the well. Add salt and 1 T. olive oil. Slowly incorporate flour into the eggs, until a sticky dough forms, streaming in olive oil if necessary. This can be done via mixer with a bread hook. Cover with plastic wrap and let sit at room temperature for a half hour. Divide the dough into parts and roll each out. Using a pasta roller (hand crank or electric), roll out a length of dough, gradually decreasing the noodle width over time. The typical strategy is to send each roll of dough through each width two times before progressing to the next. Roll until you reach desired thickness. 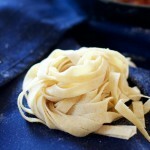 Place noodle cutter attachment on the pasta machine and send them through ( you may also hand cut the noodles). Boil batches of pasta in rapidly boiling salted water for 2-4 minutes. To dry, hang on a rack or other apparatus until dried, about 24 hours. Store dried pasta in airtight container. This sounds so easy!! Is it possible to do it without a pasta roller or stand mixer with a bread hook attachment? I don’t have room for either in my teeny kitchen (sadly). You can do it without a mixer for sure. Just mix it and knead it straight on the kitchen counter! That is how we did these batches! 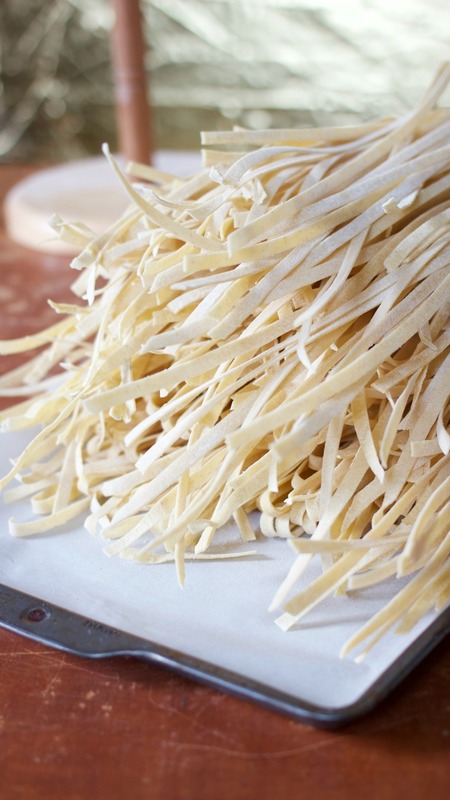 Your noodles will turn out bigger, but handmade noodles would be doable if you didn’t mind rolling all the dough out super thin and slicing then! They may need a bit more cook-time if they are a bit thicker. But I’m sure they’d be delicious.